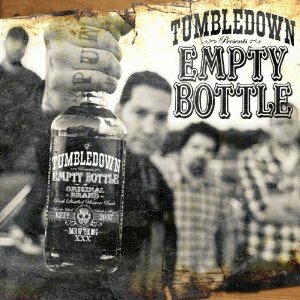 In anticipation of their new album, Empty Bottle, coming out next week, Tumbledown has released a video for their first single, “Arrested In El Paso Blues.” The “based on a true story” song was written on tour last year after the band was arrested and questioned in El Paso while travelling between shows. Being detained and hassled by the border patrol is songwriting goldmine for a band like Tumbledown. Apparently it ended as well as a situation like that could, with no charges filed and Tumbledown still making it to the next show. I had previously only heard this song done solo acoustically by Mike, so hearing the full band version in the video has got me even more jacked for the new album. The video looks really cool, with the guys setting up shop in a scrap yard and just going for it. There’s also copious amounts of fire, junkyard dogs (real ones, not the old WWF wrestler) and gorgeous Washington state pines in the background as well. I really prefer the unencumbered, scenic performance over a lyrical reenactment route, and they nailed it. Empty Bottle, Tumbledown’s second full length studio album, will be released October 26th on End Sounds. Pre-Orders for cd and vinyl can be placed HERE.